This frame is made from a Silver effect molding, it has a solid, wooden back-box at the back, this is backed with quality backing card and it contains a mount which has a space for your casts and a space for you to include baby's name, age or date of birth, by simply writing or printing it onto paper or card and fixing to the back of the mount. The glass size is 8 ” x 8” (204mm x 204mm) and the display area to display your casts is approx. 6"x5" (152mm x 127mm), please note that we use glass rather than perspex as perspex scratches too easily, the name space is approx. 0.5" x 5" (12mmx 127mm). There is lots of room to house baby curled up fists too if you need this space (as babies naturally hold their hands in fists), all our 3d frames are made with this in mind with extra depth, giving you a beautifully proportioned and elegant finished piece, this frame will compliment any decor and look fabulous wherever you display it. This is a beautiful, complete casting kit; this classic, name frame baby casting kit includes an 8”x8” (204mm x 204mm), square box frame, with approx. 2” (50mm) depth at the back to house your casts in, which is plenty to house even a curled up fist, which is naturally how tiny babies hold their hands. The silver of this moulding has a darker fleck through it, making it perfect to match with any of the paint colours we have available. 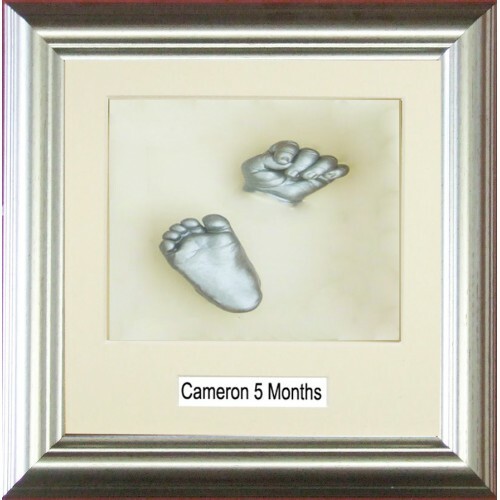 A beautiful, unique baby keepsake, with this luxury baby casting kit, the frame is made from a Flat ..
A beautiful complete casting kit including the frame; this classic, chunky framed baby casting kit i.. This is a beautiful complete casting kit including the frame; this classic, chunky framed baby casti..